I’ve looked through my various resources and I have found a few more photos of the mystery sign in Port Rowan that I wrote about earlier this week. My CNR survey of the area shows this sign, and notes it’s at “894+57” – which translates to “MP 16.94”, so it would make an unusual milepost marker. I think we can rule that out. Ideas welcome, as always. Meantime, I’ll keep looking through my resources to see if I can find a shot of one of these signs elsewhere. Could these be whistle posts? You do have a level crossing just past teach of them. BTW I have been impressed with your modeling since my days with OVAR. It’s a good guess, but I don’t think so. For starters, there’s only one level crossing in the photos – a farm crossing between the orchards at the yard lead. I doubt they would even bother whistling for it. At the other end – by the station – the track ends before reaching Bay Street. Thanks for the kind words. OVAR – that’s a while ago! Is it possible that Yard limits to a nearby yard could have been extended up to that point on that line? It could be both signs state the yard limits. 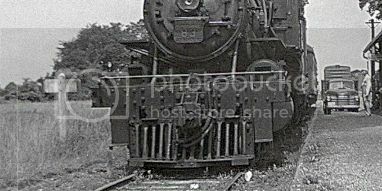 The Ma & Pa RR in York PA, had a situation like that where the Yard Limits in York extended well beyond the yard itself enabling the yard crew to do a lot of the local switching in and around the city of York, under yard limit rules. The yard limits actually started at a switch in Simcoe, almost 17 miles away. The whole branch was considered yard limits. So I’m not sure there would be another sign here. 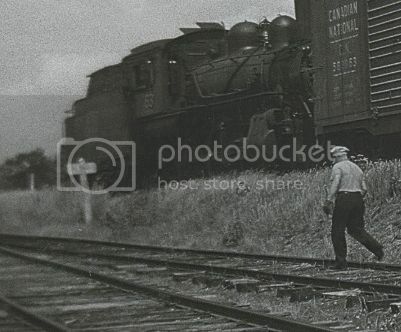 In addition, if there were yard limit boards for Port Rowan, they would likely be beyond the switches, out on the single track mainline, to allow a train to switch here without having to send out a flagman for protection. probable centered in two lines – I beleive that I may have a standard CNR drawing for a sign like that – I’ll look when I have a few minutes. Great job with the modeling and the blog / sharing of your work! Thanks for the nice words – and yes, I’d love more info on such end-of-track signs! I’ve been looking through some books and found similar signs at other stations. Owen Sound is an example. All have their back turned to the photographer. Most frustrating! I have been following your blog, – and what a delight. These small rural hamlets have many similarities and it is so interesting to see the details that you run across modelling Port Rowan. Interesting – I am doing CP in the small western village of Mather to where I used to haul grain to the local Pool Elevator. on the front and back covers of the book are similar shaped signs as yours. In this book, Joe Smuin seems to call the sign on the back cover a “Station Mileboard” , although there is no mile number on it, only the station name. I have DCC – ed some CP GP 38-2 diesels and an SW 1200. Is there any chance that some person may hijack some CP diesels, run them from Tillsonburg to Simcoe to Port Rowan? I know this is a dicey issue running CP diesels on CN tracks, however, I did see a CP Box in one of your photos. I think the answer you are looking for can be found in a document entitled “CN Standard Clearance Diagram” (I found this document in the CP SIG library page at cptracks.ca). There is a sign, about the same size as your mystery sign, that reads “Engines must not pass this point”. This would require idler cars to be used past the sign. Hope this helps! Looks like the back of a flanger sign to me- ie. to instruct plow and flanger crews to raise their flanger blade to avoid damaging switches, crossings, etc. “DO NOT TRESPASS”. The similarities between the signs lead me to this conclusion. And you can almost read these words out on the sign in the last photo. I believe your sign might read End of Yard Limits. there is a sign that one of my neighbours has for Vittoria which reads Yard Limits One Mile. When this was the South Norfolk Railway then a Grand Trunk Line trains ran faster. 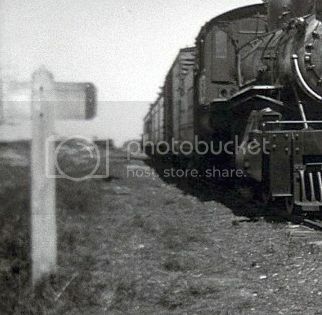 In the early 1900’s there were two trains passenger trains that ran daily as well as freight so this line wasn’t all yard limits in the beginning. Hi Trevor- There generally is not a 1:1 relationship between stationing (i.e. 2710+42, etc.) on the railroad and mile posts. Sometimes you might find a mile post 4900 feet from another, or 5300 feet and so forth. Mileposts are located where they’re located and nothing more. I assume they originally tried to get them at a mile apart, but that didn’t always happen. Trevor, here’s one more colour eBay shot that shows the whole “DO NOT TRESPASS” sign. Thank you Steve – well-spotted!